Don Lansu for the Northwest Herald Recent Cancer survivor Jim Nowak Sr. throws out the ceremonial first pitch at Saturday's "Strike out Cancer" fundraising game between Hampshire and Woodstock North High schools. Nowak Sr. is the grandfather of Hamshire varsity player Andrew Brown. 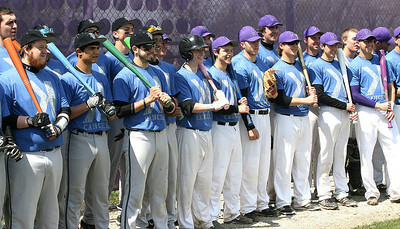 Don Lansu - for the Northwest Herald Using colored bats representing the varioius Cancers affecting many people, members of the Woodstock North and Hampshire baseball teams line up during pre game ceremonies Saturday, May 17, 2014. 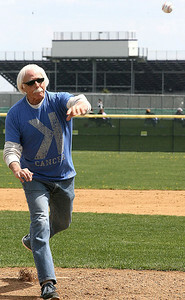 The "Strike out Cancer" game helps to raise funds for Cancer awareness and reasearch programs. Don Lansu for the Northwest Herald Jake Fiorito of Woodstock North (left) runs into third base, as Hampshire third baseman Corey Michaelsen (center) and shortstop Dillon Kuhn make the play in the infield. Fiorito went on to score, but Hampshire defeated Woodstock North 8-2 during the Strike Out Cancer game Saturday, May 17, 2014. Don Lansu - For the Northwest Herald Hampshire's third baseman Corey Michaelsen throws out the Woodstock North baserunner for the third out as Hampshire defeated Woodstock North 8-2 in 7 innings during the Strike Out Cancer Game Saturday, May 17, 2014. 5/17/14. Don Lansu for the Northwest Herald:Woodstock North H.S. 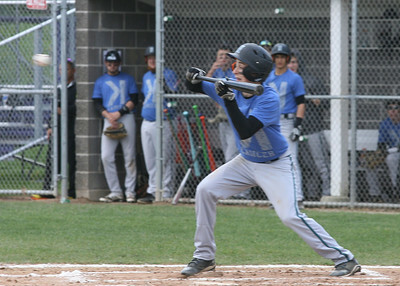 Josh Jandron lays down the perfect sacrafice bunt to move the baserunner during action at Hampshire H.S. 5/17/2014. Hampshire defeated Woodstock North 8-2. 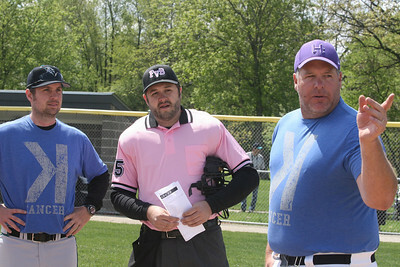 Don Lansu for the Northwest Herald: Woodstock North head baseball coach Ian Rago, Umpire Phil Dorjaph, and Hampshire H.S. head coach John Sarna go over the ground rules for Saturday's "strike out Cancer" game at Hampshire. 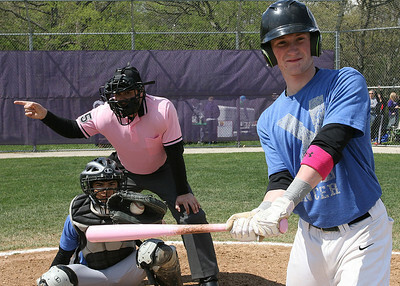 The umpires,coaches, and players wore special uniforms for the game, and the players used special colored bats that represented the various forms of Cancer. 5/17/2014. 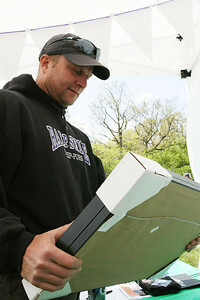 Don Lansu for the Northwest Herald:Jim Kruse of Hampshire evaluates just one of the many items avaiabile for bidding during the silent auction held at the "strike out Cancer" baseball game at Hampshire H.S. 5/17/14. The Whip Purs defeated the Thunder 8-2 in 7 innings. 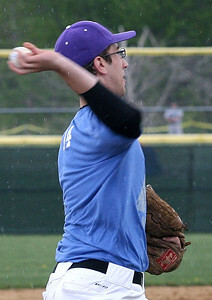 held at the "strike out Cancer" baseball game at Hampshire H.S. 5/17/14. The Whip Purs defeated the Thunder 8-2 in 7 innings.